Description: A signed, hardcover, first edition! This book traces the excitement and anguish of a young woman on the verge of adolescence who writes poetry. Afterward includes specific suggestions for writing and submitting poetry. Each of the 120 poems is illustrated in black and white collage by Elaine Clayton. a Spectrum Chldren’s Book Club GOOD READ! Bio: April Halprin Wayland is a farmer turned folk musician turned author and poet. Her newest book, NEW YEAR AT THE PIER—A Rosh Hashanah Story won the Sydney Taylor Gold Medal for the best Jewish Children’s Picture Book of the Year, awarded by the Association of Jewish Libraries. Her work has been called “dazzling”, “honest, heartfelt, poignant”, and “utterly fresh and winning”. 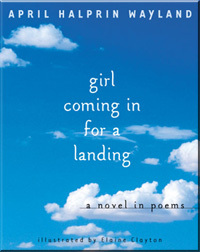 Her critically acclaimed novel in poems, Girl Coming in for a Landing, her picture books, and her poetry have garnered numerous awards including the Lee Bennett Hopkins Honor Award for Children’s Poetry, the Myra Cohn Livingston Award for Poetry, and MommyCare’s Book of the Year. She’s been an instructor in UCLA Extension’s Writers Program for over a decade and teaches workshops in schools all over the world. She lives near the beach in Southern California. WINNER: We have three winners! I’ll be sending instructions and information under separate cover. Congrats!